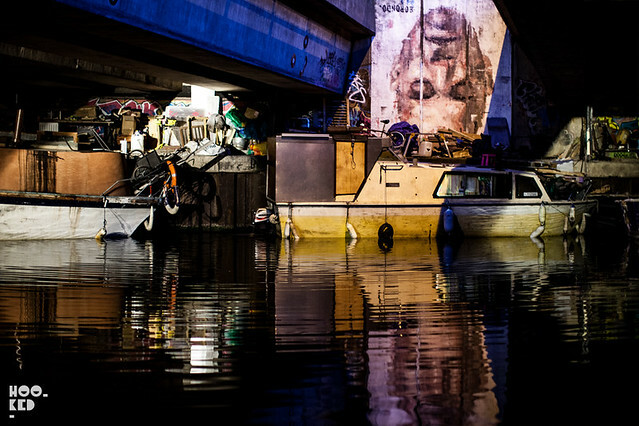 Spanish urban artist Gonzalo Borondo has been wowing us all here in London over the last year with his varied body of impressive street works from his images scratched into glass windows of empty shop fronts (covered here) to his reflective murals in Hackney Wick on walls (covered here) and narrowboats along the canals of the city (covered here). Running into Borondo at a Hackney Wick Karaoke party over the holidays, we were excited to hear the news of his upcoming London show, titled 'ANIMAL'. The exhibition is set to be Borondo’s most ambitious display to date with the artist creating an immersive experience for the show attendees. The exhibition will bring you on a sensory path where you will discover the various predicaments of the relationship between human beings and nature across eight thematic spaces. According to the press release, "Borondo aims to explore the conflict between our innate animal instincts and our present lives, which are coated with the dependence of technology and our fear for the unknown." The ANIMAL show, presented by RexRome Gallery will take place at the London Newcastle Project Space in Shoreditch and will be open to the public from the 5th through to 28th of February 2015.